You would think a train advertised as going to Vientiane would terminate in Vietiane. Hell, you would think it would end up in the right country. But my train from Bangkok decided to stop just short of the border, where several dozen tourists and I had to wait around for an hour for another train heading to Laos. This one also didn’t go to Vientiane, instead shopping 20km short in a town called Thanaleng. There I got the privilege of paying a taxi driver to take me to the center of town. When I finally arrived in my ticketed destination, I found in sleepy and peaceful. The speed limit here (and everywhere in Laos) seems to be about 7mph, not because of an excess of traffic, but just because its nicer. They say the PDR in Lao P.D.R. stands for Please Don’t Rush, and it’s easy to see why. As well as the glacial speed of the roads, the people are calm and quiet, they don’t tout much, and they take their time cooking and serving food. I found a similarly serene hotel a few streets away from the main, old, slightly touristy part of town. I wondered down to the Mekong river. I had been expecting an impressive sight – people say its a perfect place for an evening beer – but was a little underwhelmed. The river was far in the distance, in the middle of a massive sandy estuary with weedy looking plants trying to make a living. It looked like quite a lot of industrial work was being carried out further downstream. Still, the banks were very nice. This side (in Laos) a landscaped garden had been made, with a giant central statue of a communist soldier. Far across the bay, on the other side of the river, Thailand also looked nice and green and rural. Pity about the wash of brown in the middle. Walking away from the river into the center, I came across a number of temples. 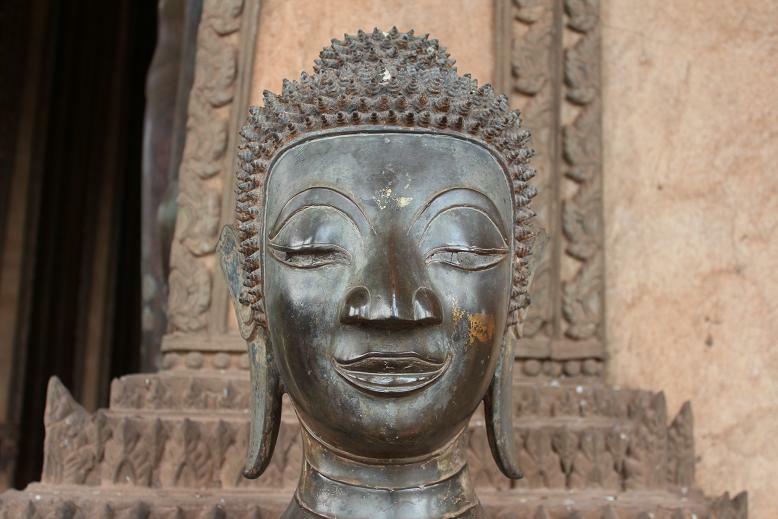 The first I went into was Wat Si Saket – the oldest temple in the city, surrounded by thousands of Buddha statues. I met a scientist called Tom, who was in town for a few days to visit colleagues researching tropical diseases, before heading back to Bangkok to do similar work. Together, we went around the other temples (Haw Phra Kaew – the temple where the Emerald Buddha once stood before being taken by the Thai), Patuxai (a giant arch, similar to the Arc de Triomphe, only bigger and more Lao-y), resturants, snooker halls and bars. The next day, I did more stuff. Sorry, the effort of writing a blog about every day of your travels means that occasionally detail is sacrificed for the sake of brevity. I’ll try and put some more effort in. I went to the National Museum. Guh. That took a lot out of me. It was quite good inside, a nice section about the dinosaurs and ancient animals of Laos, some ethnography and archaeology of the area, and a whole top floor dedicated to the fight against the “American Imperial oppressors.” I then took a tuktuk to Pha That Luang, a giant gold stupa. It’s one of the most important national emblems – it’s on all the currency – and certainly deserves to be. It’s proabbly covered in more gold than there is backing up the Laotian currency. In the huge courtyard in which it is situated, is also a number of equally impressive temples and colonial buildings. Later, I met up with a Couch surfer, a member of an online organisation that helps travellers and local people meet up, called Drew (I think), and whiled away a lazy afternoon and evening eating pizza and drinking BearLao. My third day in Laos wasn’t planned, but I had managed to arrange to interview an American scientist who was also studying diseases in Laos. He worked for the Pasteur Institute, an organisation which takes local graduates and trains them to be infectious disease researchers. Eventually, these local scientists would take over the running of the Institute, over the course of a generation. He showed me around the labs, which were barely used, and told me of the research projects they were about to carry out in the countryside around Vientiane. I wished I could have stayed longer, to talk to the local Laotian researchers, but I had already stayed too long. I needed to get to my next destination – Vang Viene – and to do this I needed to invest a good 8 hours on a local bus to get there. I’ll tell you how terrible the bus journey was on my next post.